The 5th birthday of such an important installation of the Ordnance Department, such as Butzbach Ordnance Depot, should certainly be occasion enough for us to consider its historical development. Unquestionably the history of this Depot reflects the history of the US Army in Germany, and Butzbach did provide much help at the end of the war when the US Army was faced with the problem of collecting the voluminous quantities of combat material, such as weapons, vehicles and spare parts returning this material to serviceable stock and to the ZI. 515th Ord HM (FA) Co.
578th Ord IN (FA) Co. In addition to military personnel, a Displaced Persons Co. of 272 persons and a Prisoner of War Co. of 379 men were employed in the operations of the installation. The 7th Army took over the installation in July 1945, ead effective 1 September 1945, the Depot became a TSFET unit and was transferred to the 54th Ordnance Group. In October 1945, the 54th Ordnance Group became inactive and the operation of the depot was transferred to the 60th Ordnance Group. Operations of this group proved to be difficult because of the redeployment of personnel. Most of the experienced Ordnance personnel were redeployed and it was necessary that new and unexperienced personnel be trained to do Ordnance work. At this time experienced German personnel and DP's as well as POW's assisted greatly in accomplishing the mission of the installation. Some figures may illustrate the work done during the first six months of the operation. During this time more than 3000 maintenance jobs, 450 major welding jobs and 600 service ,jobs were completed. More than 8000 artillery pieces were preserved for permanent storage. 11,000 major items were stored. The Instrument and Small Arms Sections received during this period 430,000 pieces and shipped out approximately 250,000 pieces. These figures show the importance of Butzbach Ordnance Depot as a Collecting Point during this period. No rebuild lines were set up from April 1945 until 1946, however, much Field Maintenance was done without these rebuild lines. After 1 January 1946, a maintenance shop was set up. Many difficulties due to the shortage of military personnel were to overcome. The Commanding Officer at that time, Major Thomas M. Stephens, reported that the employment of eight (8) US Civilians served to relieve the situation somewhat. To the 47th Ord Bn was assigned the 910th Ordnance HAM Co. which operated the maintenance shop for the headquarters vehicles of Continental Base Section in Friedberg, and the 3405th Provisional MAM Co. which operated the Buettelborn Reserve Vehicle Park. 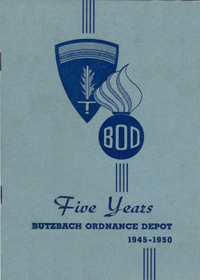 The most important single event in the history of the depot during this time was the receipt of letter, Headquarters USFET, subject;"Disposal, Butzbach Ordnance Depot", dated 8 April 1946. This directive made it possible to plan for the ultimate disposition of the many items of Ordnance equipment which were stored at the depot. Among other things the directive specified that certain items would be demilitarized, others retained for depot stock, and still others declared surplus to the Office of the Foreign Liquidation Division. Now that the mission was clearly outlined the work began to earnest in compliance with the directive A great number of combat vehicles and artillery as well as fire control instruments were shipped to the Zone of Interior. Also, the first program for installation improvement was proposed and the work initiated. The reports at this time (June 1946) show that great improvements were made at Butzbach Ordnance Depot. For example: Proper accountability was established, a stock record section was activated and the first inventories of vehicles, small arms, etc. were made. The turn-in of material gradually terminated. Based on this fact the depot was declared a turn-in point for fire control and instruments only. a. To receive, store, issue and preserve in storage Ordnance Items of Class II and IV Supply. b. To process and ship to the port of Weser, items for the Zone of Interior. c. To strip all items of value from equipment to be demilitarized. d. To process and ship to the Theater Reserve Storage Area all items so allocated. e. To establish a Theater Supply Point for Materials Handling Equipment for the European Theater. f. To operate a Fourth Echelon Maintenance Shop for Materials Handling Equipment for the European Theater. g. To receive, process, pack and ship to the Zone of Interior, Fire Control Equipment from other Collecting Points. h. To furnish Ordnance Maintenance and Supply support for Continental Base Section units from Bensheim to Giessen. j. To furnish roadside service, by means of highway Patrols, from Service Stations on the Autobahn from Mannheim to Hersfeld. k. To furnish emergency repair and 4th Echelon repair service at Butzbach. l. To repair, for release upon demand, combat vehicles, general purpose vehicles and artillery from the Butzbach Ordnance Depot Vehicle Park. m. To set up contact teams to contact Continental Base Section using units to improve services and supply. n. To furnish Ordnance Technical inspection team as required by Hq., 60th Grp. o. To operate a Box Factory to supply all boxes necessary for shipment of small arms, instruments and major assemblies. p. To rebuild batteries. Up to 500 for January, 1200 for February, 2000 for March. It may be very interesting to note that already at that time a further mission, that of furnishing tank maintenance for the European Theater, was contemplated for the depot. Even at that time key-personnel were assigned but only a program of instruction for this mission and not the mission itself was begun. a. The Battery Rebuild Shop which rebuilt unserviceable batteries. c. The Materials Handling Shop, which repaired such items as fork-lifts and similar materials handling equipment. Everybody, who knows Butzbach Ordnance Depot, knows that there always has been a hard fight against mud in wintertime and dust in summertime. Therefore, it is not surprising that the project number one at that time was that of laying hardstanding throughout a substantial portion of the depot area. In personnel reports of this period is stated that an inventory in the receiving lot could only be taken by the help of a tracked personnel carrier. Actually, this was the only adequate transportation in Butzbach Ordnance Depot at that time. In April 1947, the Materials Handling Shop phased out and the Giessen QM Depot was designated as a Base Maintenance Shop for repair of materials handling equipment. A report from 1 April 1947 shows that the most serious handicap in the operation of the depot was a lack of trained personnel. This deficiency continued to be a most serious one. It is very interesting to see that the commanding officer tried to overcome this difficulty by providing transportation for German personnel. It is reported that at that time about 600 persons were transported daily. In the middle of the year 1947 many major problems were to overcome in Butzbach Ordnance Depot. The mission of the installation was still to receive, maintain, preserve, store the various types of Ordnance material such as artillery, automatic weapons, small arms, fire control instruments and general and special purpose combat vehicles. The depot employed at that time besides the military personnel (150 enlisted men and 16 officers) 250 Polish Displaced Persons, and 372 German civilian employees. Approximately 400 enlisted men assigned to the operation were lost during the period of 12 months. Changes in mission, plans, and policies, were a major problem, and there was not a definitely clarified mission assigned to the depot. At least frequent changes were made. In April 1947 to the mission of the Butzbach Ordnance Depot was added the rebuild of 2½-ton general purpose vehicles, so that at that time the Butzbach Ordnance Depot operated two (2) maintenance shops, the Battery Rebuild Shop and the Maintenance Shop. These shops repaired general purpose vehicles and processed combat vehicles for shipment to the Zone of Interior. But the disposal of material to OFLC, ZI and other depots was still the main operation of the installation. 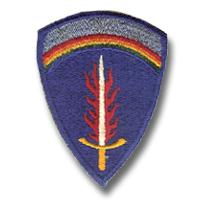 The 7842nd Ordnance Rebuild Detachment was activated by Hq EUCOM, OCO, on 9 October 1947. During August 1948 the installation was directed by the Chief, Ordnance Division to plan for the closing out of the GMC Rebuild shop and the installation of a Tank Rebuild Shop, the shop to be in operation by 13 October 1949. This was a major change in the mission of Butzbach Ordnance Depot. It is certainly interesting to see how this big task has been solved. This is one example of the excellent cooperation of everyone in Butzbach Ordnance Depot. In order to establish a Tank Shop, the GMC Shop had to be completely renovated for the new mission. This consisted of completing a heating system which had not been in operation, laying a cement floor for the entire area, increasing lift capacity of overhead cranes from 3 tons to 10 tons, laying of a plate steel floor over the newly constructed concrete floor, repainting the inside area of the shop, and making various other building modifications necessary for Tank Rebuild. In order to accomplish the necessary work in the time allowed the personnel which had been assigned the GMC shop were utilized in the re-habilitation of the building on a round-o'clock basis (3 eight-hour-shifts). An Engineer project for the hard surfacing of the floor was hand-processed by the Commanding Officer thru Had Nauheim Sub Post, Frankfurt Military Post, and EUCOM Hq for approval. Ordnance personnel assisted in the laying of the floor and did all other re-habilitation with material on hand. All welders on the installation including those from the Ordnance Service Section, old GMC Shop, Artillery Shop and Small Arms Shop were assigned to welding steel plates to cover the floor. Additional welding equipment was obtained from the Bad Nauheim Sub Post in order to expedite the necessary steel welding. On 13 October 1948 the Tank Shop went into operation with the requested capacity. In the meantime the disposition of unserviceable material was nearly completed. On 15 June 1948 a big area with a lot of vehicles and other equipment had been turned over to STEG. So that it did not come as a surprise when a new mission was assigned to BOD for the Supply Division. On 12 November 1948 the installation was directed to prepare for storage and supply functions pertaining to A, B, D and C Ordnance group items by 1 March, 1949. The transfer of the A - D group material from Griesheim Ordnance Depot to this installation was completed at 15 August, 1949. As a result Butzbach Ordnance Depot was established as a mission depot and, as a consequence of that, Depot Operating Supply was enlarged in order to separate Command and Rebuild Stocks. This reorganization included that of the Property Disposal Branch which is now operating as a reprocessing unit within the Storage Branch. At the present time Butzbach Ordnance Depot is on the way to take over another mission, that of storage of all F-group items and rebuild of these items. A report in this history of all the improvements made in Butzbach Ordnance Depot during the year 1949, would make this report too long. Engineer projects were completed, the technical equipments were improved and many special measures were taken to set up an organization of high efficiency. More than 16 officers, 16 DA Civilians and 1300 German employees are to-day working on missions assigned to Butzbach Ordnance Depot. Five years history of an Ordnance Installation is certainly only a short time. But even during this short period there were so many events that the chronicler finds it hard to make tha right selection. Some information is no longer available and many statements had to be made on the basis or verbal tradition. The purpose of the short historical report is to remind those men, who were present at that time of an industrious period and to show in the future that the watchword at Butzbach Ordnance Depot has always been work and efficiency. If you have more information on the history or organization of the Butzbach Ord Depot, please contact me . 1st Lt Donnelly, Emmet F.
1st Lt Krause, Donald A. 1st Lt Hill, Irving F.
1st Lt Becker, Wilbert R.
1st Lt McKenzie, William R.
1st Lt Kubit, Thaddeus A. 1st Lt Jaco, Charles M.
1st Lt Sharkoff, Eugene G.
1st Lt Bethel, Charles E.
Tank & Artillery Reb. Br. A Working Place for German Civilian Employees. The five years existence of Butzbach Ordnance Depot gives rise to a discussion of the question of employment of German civilians by the US Army. In other articles of this pamphlet the problem of procuring the necessary man-power for the management of an installation such as BOD has been discussed. A glance into past reports shows us that the question of how to procure trained and skilled personnel for the many difficult administrative and technical missions has recurred again and again during the operation of Butzbach Ordnance Depot. In April 1945, more than 2000 soldiers with their officers were employed at BOD. In addition, there were about 500 Displaced Persons and approximately 130 Germans, most of whom had remained at the Depot, since they had been employed by the former occupant, BAMAG. The deactivation of the military units involved the current decrease in the number of soldiers at BOD. Besides this, resettlement and emigration for civilian employees were performed on a larger scale, so that the question of how to replace employees became of decisive importance at BOD. At first, only Prisoner-of-War Companies were available, but soon a systematical drafting of German manpower into the Depot began so that by the middle of the year 1946 approx. 800 to 900 Germans were permanently employed by the Depot. The employment of German civilians raised problems in the management of the installation, the solution of which did not fully lie within the authority of the commander. On looking back one can say that the appointment of German employees and the assignment of responsibilities to Germans ran generally parallel to the development of the political situation in the occupied western zones. It was not easy to introduce, without any troubles, Germans into work sphere which was strange to them, and in addition language difficulties brought about further problems which should not be underestimated. Nevertheless, a specific relation between the members of the US Army and the German employees has developed from the co-operation of these two groups within the Depot. a. Indigenpus personnel will be managed and administered with a maximum use of applicable laws, practices and Services of German agencies consistent with requirements of the Commander-in-Chief. b. Management of indigenous personnel will be conducted to exemplify the democratic way of life. c. Indigenous personnel will be placed in jobs for which they are best fitted by aptitude and experience, with full consideration given to the preference of the individual. Releases to the German economy will be provided where unutilized skills are critically needed. d. Opportunities for advancement will be given. e. Performance will periodically be evaluated in the interest of good supervision and improved work performance. f. Indigenous personnel will be classified and paid for service in accordance with Military Goverment regulations and applicable law and practice. g. Indigenous personnel will be properly informed about policies and plans affecting them and their work. i. Indigenous personnel will be free to express themsolves individually or collectively on matters affecting work and morale in accordance with established procedures. k. Indigenous personnel will be trained to perform their jobs and for advancement to more responsible positions for which they are needed. l. Procedures for maintaining records and channeling administrative papers will be as uniform as practicable. m. Indigenous personnel will be utilized to the maximum for specialized indigenous personnel management and ad, ministrative positions. With reference to these provisions the placement of German civilians into responsible key positions was started in BOD as early as the end of 1946. Numerous responsibilities concerning Depot management were laid fully into the hands of Germans. From the mass of German employees arose those who, according to their talent, education and experience, were appropriate to be assigned supervisions in the individual sections. On the whole, the year 1946 was devoted to this task. In September 1948 the idea of co-assignment of German employees to the Depot management was realized on a large scale under the supervision of Lt. Col. Bills, who was at the time the Depot Commander. The German organization of BOD is based on the simple idea that nobody can serve two masters, that is, the German director and the responsible key personnel receive orders from the commander, and his military representatives. Then they put into operation these orders within the German organization, under their own responsibility using their accustomed methods, and speaking their own language. Today the activity of the Butzbach Ordnance Depot is very similar to any other German industrial plant. Having been entrusted with responsibility, the German employee has gained self-confidence and takes pride in the development of suggestions and improvements, which have increased the efficiency of the entire depot, raising it to a high level. The German employee has gained a feeling of security in his place of work, he knows that much is done for him, within the limit of regulations, to insure his safety and personal welfare at the depot. For the furtherance of his skills "on-the-job-training" and school courses are provided. His suggestions also bring him awards. BOD has already paid out DM 1,576.00 for suggestions alone. Participation in the Work Simplification Program is surprisingly large and the accomplishment of new Cost Accounting Procedures finds complete understanding and support. A feeling of solidarity has developed among the employees. This comradeship found expression in the BOD excursion to the Rhine in 1949, in which approximately 2 000 Germans and Americans participated. A Depot Journal "BOD Mirror" has been published regularly since 1949. In this periodical problems of working life are discussed. A review of BOD's past five years shows that the German employee has given an increasing contribution to the accomplishment of BOD's mission within the German organization. The oldest Employees report on the first Days of BOD in 1945. Little work was done in March 1945 in the BAMAG plant. Often no electricity was available, or perhaps an air raid warning was given shortly after the day's work had begun, interrupting the operation of the plant. Each day the front came closer to Butzbach and one could clearly hear the roar of the guns and bombers. Some unteachable persons tried to blockade the entrance roads in the last moments by erecting barricades and by mining the streets. The excitement and tension was staggered to a high point and became almost unbearable. Than Butzbach and the BAMAG plant were taken over by the units of the 3rd Army. The BAMAG plant was turned over to an American 1st Lieutenant by a civilian manager. He arrived with about eight armored scout cars and was received at the plant's entrance by the manager and his interpreter. All gates and doors of the plant were opened for the surrender. The plant was confiscated by the 615th BAM Bn for use as an Ordnance Depot or a Base Shop. The Commander at that time demanded 2 men from the manager for use in maintaining the electric and water supply of the plant. Mr. Robert Schreiber and Mr. Heinrich Damm were placed at the disposal of the American unit and so it happened that they became the first Germans to work at BOD for the Americans. The main job of these Germans at the plant was to supply the kitchen with water and electricity and to maintain drainage and sewage systems. The co-operation with the American soldiers, who were experienced, was frictionsless. Mr. Damm, who still works at BOD, gladly remembers his first American cigarettes, However, he was never left unobserved for a moment. A soldier accompanied him with a gun wherever he went. Immediately the work of clearing the large building began and 250 former plant employees were needed for the accomplishment of this job. On 11 April 1945, the workmen were informed by a posted notice to report at the plant. The shop started to expand and the repair of tools and machines became necessary. Captain T.W. Scott, the Battalion Utilities Officer, gathered all of the skilled men in the Utilities Section from which the present Ordnance Service Branch developed. These men were assigned to do repair and maintenance work. Capt. Scott also paid out the first wages. The standard wage for the clearing work was 50 Pfg. (Pfennig) per hour. Mr. Damn was the best paid employee at that time and he received 90 Pfg. per hour. In addition to this pay, each worker received 2 cans of food, which contained beef with beans, pastry, and sometimes cigarettes. This food was passed out to the workers every morning. In 1946 the personnel strength was increased considerably and conditions started to return to normal. In the first days of BAMAG's conversion many a machine was destroyed, but we, the first employees, always attempted to keep the remaining equipment in as good a condition as possible. The military personnel with the longest service within Butzbach Ordnance Depot are Sgts. Paul E. Hussey, Hugh E. Hayes, Clyde Everett and Pfc. Ralph E. Dungan, all presently members of the 7842nd Ordnance Rebuild Detachment. These men have had continuous service at the depot for over four years arriving at a time when the installation was still an evacuating center and the fields for miles around the Butzbach area were covered with tanks, trucks and artillery. They remember many a time when the access road from the Autobahn was solid with vehicles being driven to the receiving lots. During this period the depot was innocent of any hard surfacing. The area was requisitioned from the local farmers and the vehicles were scattered throughout the sugar beet fields. In a normal working day the dust was so thick that a person could not even see the depot area. The only times that visibility was more than a few hundred feet was on Sunday. During the rainy season of the year the dust turned to mud so thick and slippery that the only vehicle sure to reach its destination was a "Weasel". The oldtimers remember when there were over 1000 enlisted men stationed at Butzbach. There were three clubs, a dance hall for the enlisted man and the club for officers was located in the Deutsches Hans Hotel in Butzbach. The living quarters were in very bad condition since they had recently been taken over and had been formerly offices. One company was quartered in tents in the present dayroorm area. At about this time there were five Ordnance companies stationed in the vicinity of Butzbach. The soldiers feel that the many improvements since their first acquaintance with Butzbach have been so extensive that they would hardly recognize their former home. The improvements to buildings and quarters and the hard surfacing have made life much more bearable to the soldier of today. They all express the wish that they will be here to help observe the ten year anniversary of the depot. They say this with a feeling of nostalgia for the "Good old days" when life was not quite so easy. On May 14 1954, after nine years of operations, the Butzbach Ordnance Maintenance Depot was derequisitioned and returned to its original owners, Pintsch-Bamag Werke (history page on the company's website)( ), a German heavy equipment manufacturer. During the Occupation period, the depot served as one of the principle installations in EUCOM/USAREUR involved with rebuilding WWII-era equipment, more recently in support of the Mutual Defense Assistance Program (MDAP). The 83-acre Depot was established in March 1945. At that time Theater ordnance entered into a tremendous rebuild program that would result in over $1.5 billion worth of equipment being salvaged and returned to service. Originally, the Depot served as a collecting point for heavy ordnance equipment being turned in by Army units redeploying to the US after the end of WWII. Since then, the mission of the Depot has evolved. In 1947, the Depot was responsible for rebuilding small arms, artillery, and 2½-ton trucks. Later, the trucks were replaced by tanks. In 1948, the Depot also assumed the role of command stock and master supply depot. In 1951, the Mainz Ordnance Maintenance Depot was established and took over the former Butzbach mission of rebuilding small arms, artillery, fire-control devices, tractors and certain types of combat vehicles. The mission of rehabilitating M-26 PERSHING heavy tanks for MDAP remained with the Butzbach Depot. Since 1953, the Depot has been engaged in rebuilding self-propelled weapons carriers, half-track vehicles, and M-24 CHAFFEE light tanks. In 1953, 76 percent of production at the Depot was perfomed in support of NATO (MDAP). Less than one-fourth of production was involved in rebuilding equipment for the US Army. Thus the decision was made to transfer that mission (support of USAREUR) to the Mainz Ord Maint Depot and return the Butzbach depot to its original owners. 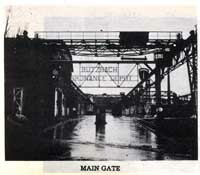 In the early days of the Depot, about 500 German civilians worked at the Butzbach Depot. At the peak of operations at the Depot in June 1951, the Depot employed over 2,280 German civilians.